Upcycle an egg carton to create jingle bell roses for your Christmas tree. 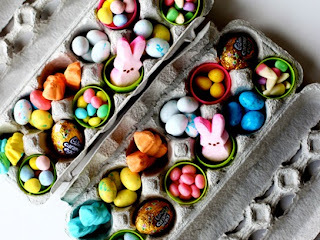 Cut off the lid of a cardboard egg carton, then cut around each individual egg cup (use the photo for reference). Cut leaf shapes out of the flat cardboard pieces. 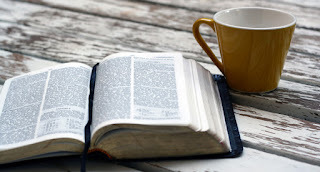 Paint each egg cup red; paint leaves green. 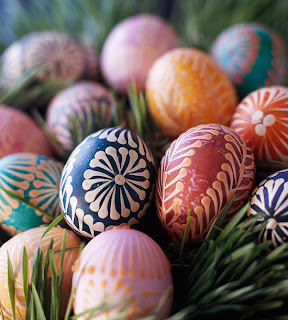 Use a yarn needle to poke a hole through the center of each egg cup and through one end of each leaf. Thread the needle with yarn and string on three leaves. Referring to the photo, poke the needle through the egg cup, thread on a jingle bell, and poke the needle back through the egg cup. Add three more leaves to the yarn, and trim the yarn to desired length. Tie the ends in a knot to create a hanging loop. These adorable bird ornaments -- made from almonds and a handmade felt cap -- are a simple way to add a natural element to your Christmas tree. Cut a hat from felt, and using three strands of embroidery floss, blanket-stitch the bottom edge of the hat. Fold the hat in half with right sides together and whipstitch together straight edges. Turn the hat right side out and stuff with polyester fiberfill. Stitch through the top of the hat with six strands of embroidery floss. Tie the floss ends in a knot for a hanging loop.Using needle-nose pliers and referring to our pattern, shape a 10-inch length of wire into a leg and foot. Bend the wire ends slightly upward to form ankles, and bend the toes slightly downward. Repeat to make the second leg and foot.Hot-glue the hat to the top of the almond. 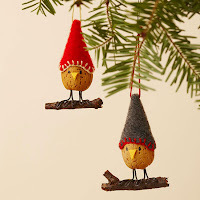 Trim the wire at the top of the legs to desired length; glue leg ends into the holes in the bottom of the almond using crafts glue.Glue feet onto twig; hold or clamp until dry.Cut a small diamond shape from yellow cardstock. Fold diamond at center and glue to almond for a beak. Add a dot of puff paint for each eye. 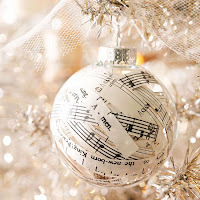 A clear ornament ball stuffed with cut up pages from an old book and sheet music adds a handmade accent to any bibliophile's Christmas tree. Customize the look of plain glass ornaments for your Christmas tree in a pinch. 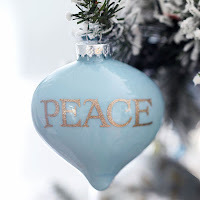 Remove the top of a glass ornament and swirl around crafts paint diluted with water until the inside of the ornament is coated. Let it dry upside down, swirling with another layer of paint if necessary. Replace the top, and add a Christmas message with adhesive scrapbooking letters. 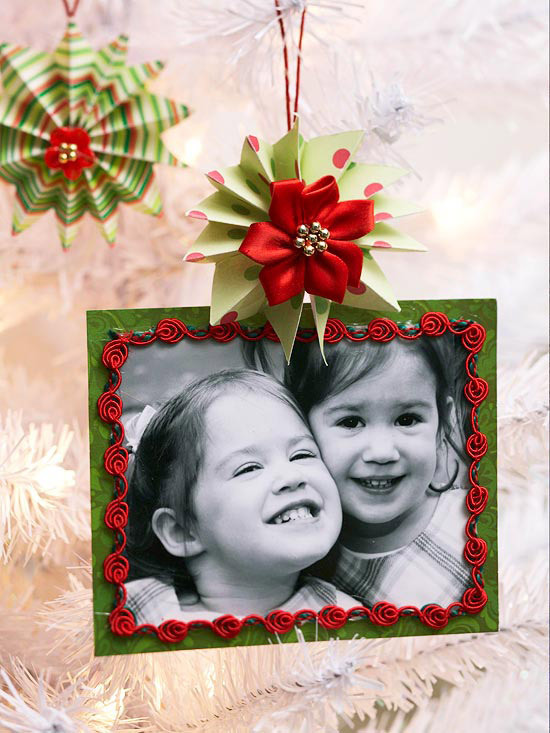 Frame a favorite photo with Christmas paper and trims for a touch of nostalgia. Use a black-and-white photo, which will stand out against the colorful embellishments. 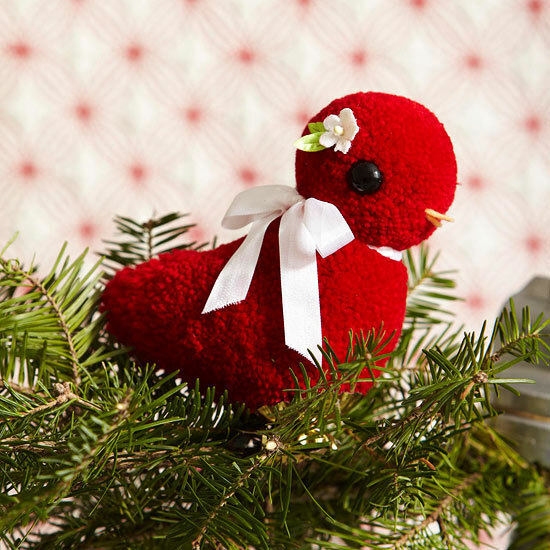 This pretty bird ornament fashioned from yarn-wrapped pom-poms perches on your Christmas tree like a live bird. Use pom-pom makers and red wool yarn to make one large and one extra-large dense pom-pom; tie each with waxed twine. 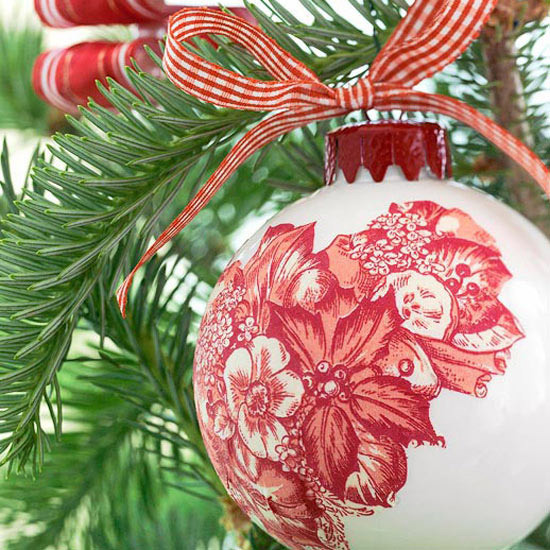 Trim the large pom-pom with sharp scissors to make the head; create a flat area on the bottom of the head. Shape the extra-large pom-pom for the body, trimming a concave area in the back and the sides flat (refer to photo). Shape a pointed end for the tail, leaving the tail yarns uneven. 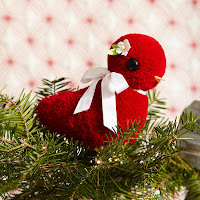 Trim a flat area at the top of the body; glue the pom-poms together to make the bird. Glue black beads to the head for eyes and glue two tiny peach felt triangles for the beak. Tie a 12-inch length of white satin ribbon around the neck, tie in a bow, and trim the ends. Glue a tiny silk flower to the head for a pretty embellishment. Adhere an ornament clip to the bottom of the bird. 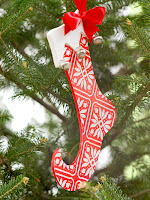 Heavy scrapbook papers transform into ornaments to hang on the tree, on gifts, or a banister. 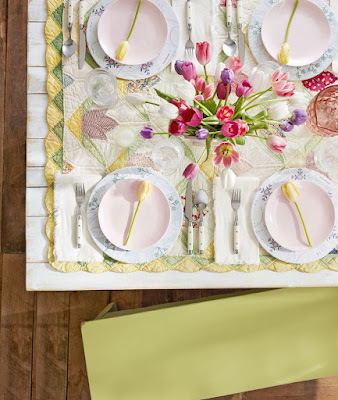 Cut patterned cardstock into twelve 1x6-inch-long strips. Loop each strip in half, patterned side out. Glue the ends together. Punch two circles out of solid cardstock and attach to the front and back center of the ornament. Add sticker letters and a twine hanging loop to finish. 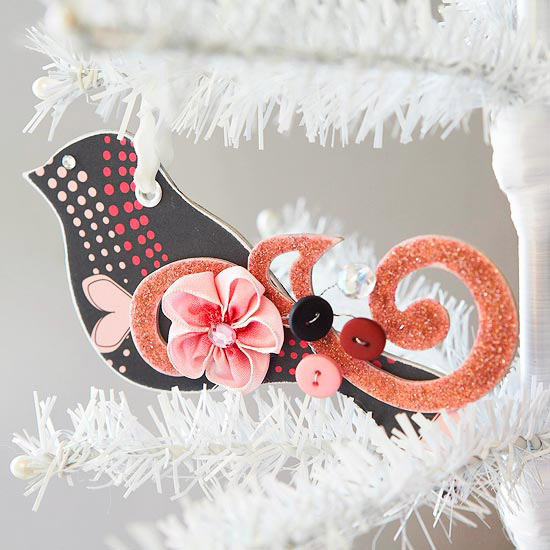 Pretty details adorn these chipboard bird ornaments. Feather your flock with coordinating papers in different patterns, and give each one a unique combination of flourishes. 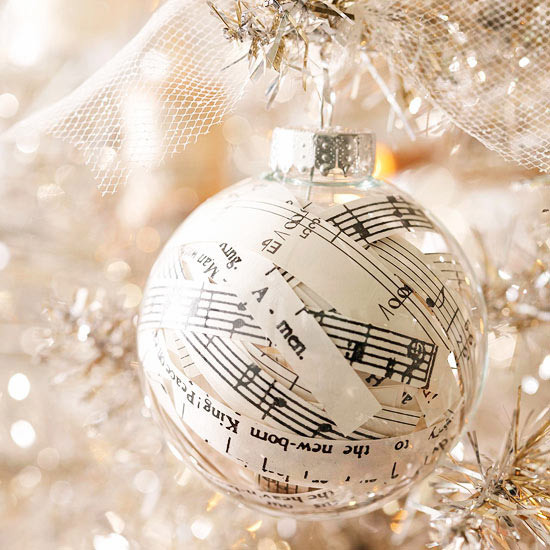 Convert commonplace items into creative Christmas ornaments. 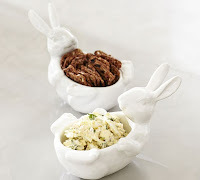 Shapely cookie cutters, dessert molds, colorful gadgets, and good-looking utensils can become ornaments with a simple addition of jute, raffia, burlap, or garden twine for hanging. Attach the natural-looking hanger using a hot-glue gun. 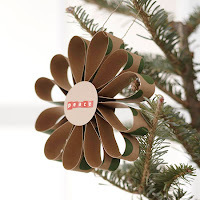 A wooden spool makes a beautiful Christmas tree decoration. 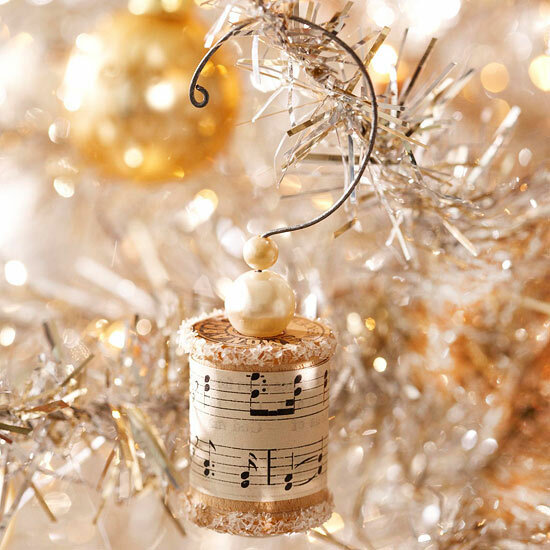 Easy to assemble, the trim is a perfect symphony of sheet music, pearl beads, glass glitter, and wire. 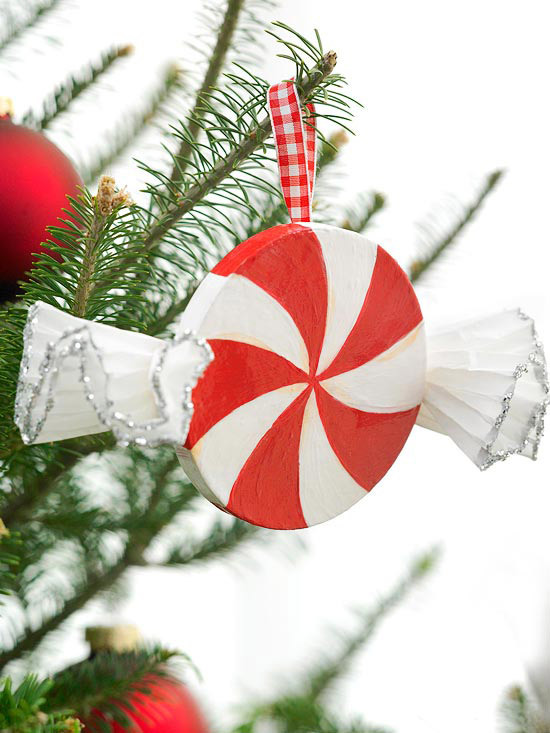 Turn a plain papier-mache disk into an ornament that mimics peppermint candy. Paint the disk white; let dry. Then paint red swirls; let dry. Apply two or three coats of glaze, letting it dry between coats. Apply silver glitter to the edges of two cupcake liners, fold each liner in half, then accordion-fold each. 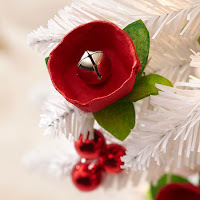 Hot-glue a liner to each side of the ornament. 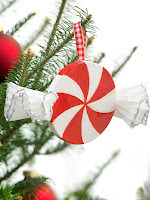 Add a ribbon hanger with hot glue. Look through scrapbooking or gift-wrap supplies with a fresh eye and you'll discover new possibilities for decoupaging wooden cutout ornaments like this whimsical stocking. 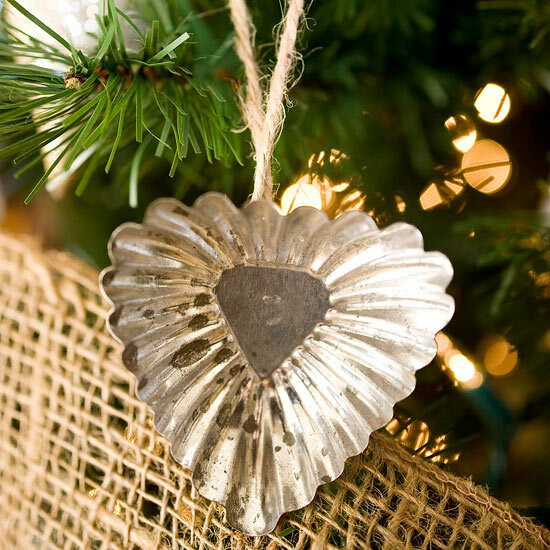 A coat of ultra-shiny clear glaze gives the ornament a perfect finish.